This species is accepted, and its native range is Peru to Argentina (Jujuy). It is used to treat unspecified medicinal disorders, as a vegetable and for food. Alt. 2250 - 3400 m.
Nativa y cultivada en Colombia; Alt. 2250 - 3400 m.; Andes. 'Roots' - edible (Granados-Tochoy et al. 2007, Parra et al. 2012, State of the World's Plants 2016). Leaves - Eaten in salads or cooked to make an indigenous soup (Parra et al. 2012). Chuguas, rubas, chuguas grises, chuguas rojas, ulluco, ullucu, chugua, ruba, chuagua. Eriksson, R. (2007). 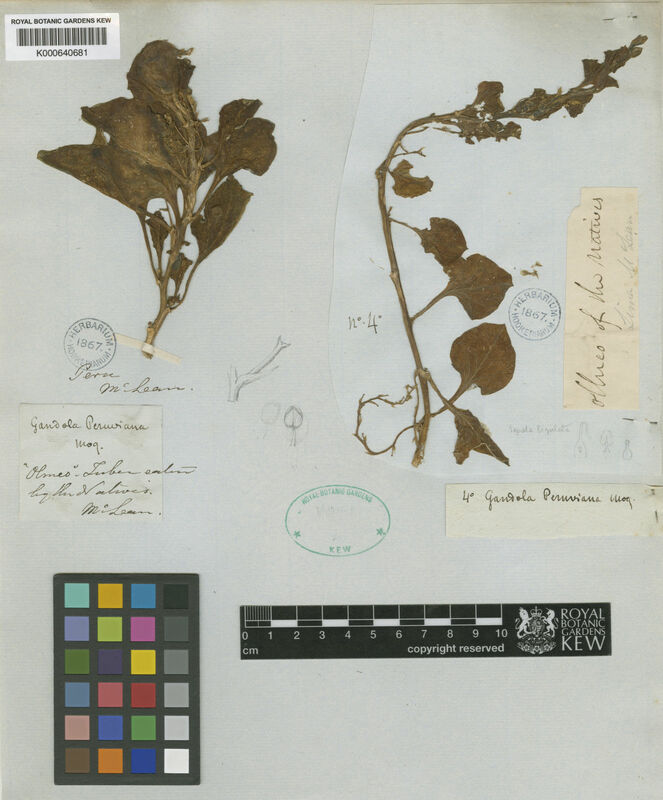 A synopsis of Basellaceae Kew Bulletin 62: 297-320.